Temple Run is one of the most copied games on the App Store, and for good reason. With over 80 million downloads worldwide, it's no surprise developers want a piece of the action. At least on the positive side, they often put their signature on these creations to stand out. That said, we couldn't help but smile at Escape Bear from Humble Gaming Limited. Although it's an obvious Temple Run clone, unique elements make it a somewhat different experience, starting with the premise. You see, instead of running from nasty demons (or whatever those things are), you play as an imprisoned bear that just escaped its cell and is presumably on its way to freedom, providing the furry can escape from a shadowy and nightstick brandishing guard. Stumble, and the pursuer beats said bear to death. With this in mind, it's in your best interest to keep the bear alive, and you do this by simply tilting the iPhone and iPad left or right to move in those respective directions, then tap the screen to jump. That's about as complex as things get, which is good, since the developers throw a bevvy of obstacles in the bear's way, including mysterious hands that slow it down, spikes, lava pits and monsters that'll slaughter the prisoner outright, transforming the poor guy into gory pieces. The game's intense for two reasons. 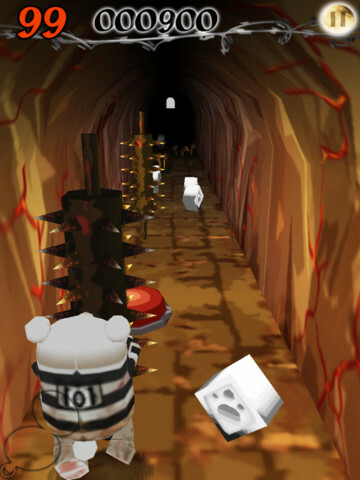 First, the developers broke the experience into bite-sized chunks, where you make a mad dash for the finish line. The game's more of a sprint, making it instantly re-playable, and levels begin automatically, one after the other. Second, the sub goal involves picking up as many little icons/coins as possible; grab them all, and you receive three gold stars. Beyond that, they function as the game's virtual currency, used to buy a bunch of things, from an upgrade that slows things down, to armor and a variety of different characters, like a ninja or gingerbread man. Problem is, it takes an unreasonable amount of time amassing enough coins to buy the most expensive items; the Indiana Jones inspired character costs 8,000. As always, you'll find coins available for a price. Beyond that, Escape Bear is enjoyable. We dig the spooky music, creepy sound effects and user-friendly controls; ah yes, and the carnage. It's clear to see where Humble Gaming drew its inspiration, but considering the quality game it created (free, by the way), we had no qualms putting Escape Bear into our rotation. Neither should you, for that matter. 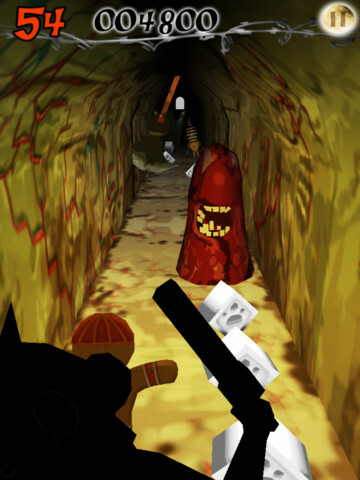 What's Hot: Intense run for your life gameplay, spooky audio, user-friendly tilt controls, free-to-play. What's Not: Grinding to afford everything.